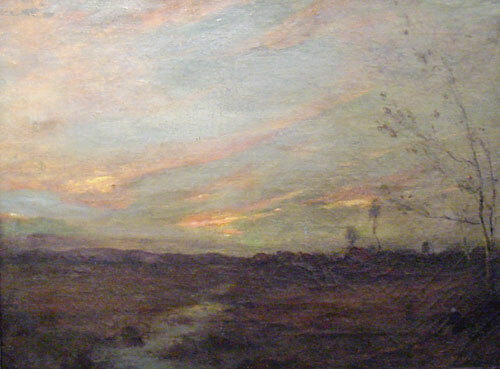 Setting Sun, oil on canvas, 15" x 20", s.l.r. Born and resided in New York City. Known for western landscapes and skyscapes. Began painting Atlantic Coast. Then, he visited the West with Brooklyn Indian ethnologist, Professor Stuart Culin. Painted landscapes of Arizona and New Mexico. He continued go back west and paint. Making the public aware of the beautiful landscapes of Arizona. Studied: Munich, Germany; London, England; and Royal Academy in Antwerp. Member: National Academy of Design, 1910. Medals: Arizona won a gold medal at the Pennsylvania Academy of Fine Arts, 1906. In the collection of: Fort Worth Art Center Museum; Carnegie Institute; Reading Public Museum;Washington University; Huntington Museum of Art; Metropolitan Museum of Art; National Academy of Design; United Sates Dept. of the Interior; Art Association of Richmond; Museum of Fine Arts, MA;Montclair Art Museum; Newark Museum; St. Louis Art Museum; Smithsonian American Art Museum;Brooklyn Museum; and more.